The Fed threw the market a curveball this week, as the release of the April Federal Open Market Committee (FOMC) meeting minutes revealed that Janet Yellen and company are indeed willing to hike interest rates again at their next meeting. That meeting is in June, with another meeting scheduled for July. But could the Fed really hike rates at one or both of these meetings? Traders are betting against it, but judging by the Fed Funds futures (a way to speculate on future rate hikes) the odds of a June hike have increased markedly. In fact, before the release of the minutes on Wednesday, the Fed Funds futures were indicating only a 4% chance of a rate hike in June. In just the past three days, that probability has jumped to 30%. The reaction to the hawkish Fed (i.e. more willing to hike rates) from the equity, commodity and currency markets was fast and furious. Stocks plunged, oil and gold prices fell, and the value of the U.S. dollar vs. rival foreign currencies surged. The gains in the greenback were largely responsible for the declines in oil and gold, as both key commodities are priced in U.S. dollars. The decline in stocks modulated a bit right after the news, but the S&P 500 still has come under pressure and is now well off the highs of the year. 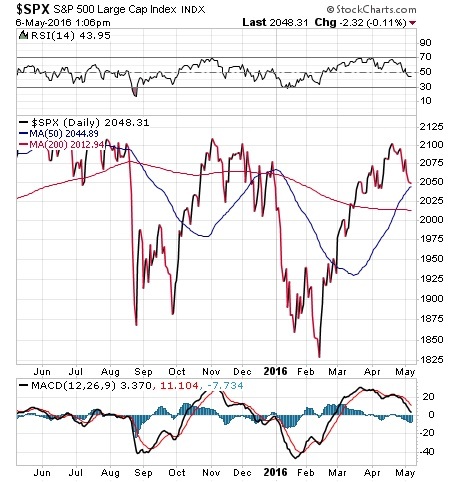 The broad measure of the domestic equity market now trades below its short-term, 50-day moving average, although we remain well above the long-term, 200-day average. As for the pressure on commodities, we saw gold prices come down as well this week. 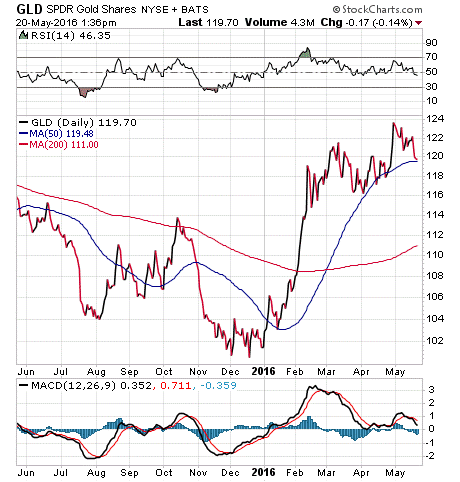 But as of this writing, the SPDR Gold Shares (GLD) remains above its 50-day moving average. As you likely know, I am a big fan of gold and precious metals right now. Although this week’s hawkish Fed surprise has taken a bit of luster away from gold, I don’t think this week’s price action is reason to fret. In fact, May and June are historically poor months for gold. Moreover, despite the recent dollar bounce, there are many more powerful tailwinds that I think can propel gold through the current, Fed-induced choppy waters. Right now, subscribers to my Successful ETF Investing newsletter are benefiting from gold’s shine, as we’ve recommended several exchange-traded funds (ETFs) in this space that have delivered big for us in 2016. If you’d like to find out how we are navigating the Fed’s hawkish surprise with our golden sails, then I invite you to give my Successful ETF Investing newsletter a try today. The DoubleLine Funds CEO and CIO is someone I admire, and someone whose bond funds I recommend to both my newsletter subscribers and my money management clients. Jeff Gundlach reminds us with this quote that worrying about failure is a sure way to get distracted from the real task at hand, and that is actually to focus on your business. Excellent advice, for sure. In case you missed it, I encourage you to read my column from last week about the recent proof of gold’s bullish trend. I also invite you to comment about my column in the space provided below. Exchange-traded fund (ETF) expert Doug Fabian continues his spotlight on top-performing gold mining funds. This one is up nearly 75%.